Lead Pages, Sales Funnels, Sales Pages, Webinar Registrations, Affiliate Funnels… step-by-step. Here’s a focused quick course that shows you exactly how to create the landing/optin page you need and connect it directly to your email marketing automation service. You’ll need to study the course and do as it shows for success, following the very simple video modules. In this example we’re using Thrive Leads, ActiveCampaign and of course your WordPress site so you can grow your list as soon as you complete the course. No complicated page design or graphics required! ….with much less effort and skill than you may think! 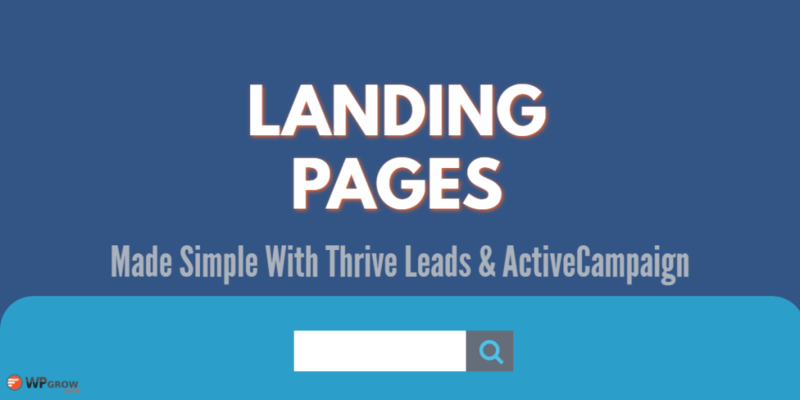 Today, you can grow your list consistently, using this landing page process and strategy, with no prior experience! Implementing what you learn today is the first step in growing your business and selling more courses online. Follow along by looking right over my shoulder, on my screen, and see exactly how I set this up quickly and effectively, from start to finish. Over 14 lectures and 2 hours of content! Anyone who wants to earn an grow their list and income.